Rediff.com » Movies » Review: Kung Fu Panda 3 is as fun as expected! Review: Kung Fu Panda 3 is as fun as expected! There's much to learn and love about the newest Kung Fu Panda movie and its fabulous, floundering, furry hero, feels Sukanya Verma. 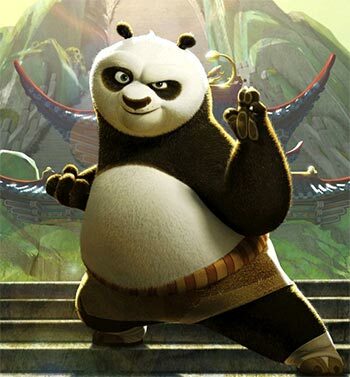 Kung Fu Panda's greatest appeal lies in its simple wisdom and a steady dedication to look beyond one's form conveyed in the infectious antics of its chubby, wide-eyed, wonderstruck panda. The franchise creates delightful myths and notions of mystical powers, of daunting designations like the dragon warrior or the key to the universe it possibly holds yet revels in revealing their ineffectiveness in absence of soul and endeavour. Believe in yourself, your best self and things just fall in place; it seeks to tell children and adults alike packaging its inspirational philosophies in an entertaining dose of frisky action and visual splendour in 3D. We witnessed his making in the first; his adventures through the second and realisations that challenge him like never before in the latest sequel, Kung Fu Panda 3. Once again in true Po tradition, the portly panda employs his goofy touch, jolly humour and fanboy vigour to defeat formidable opponents in scenes that amaze the eye and heartens the soul. Only this time, he's not the only panda in the story. The long due reunion finally takes place bringing about some tickling goose-panda rivalry while making an effective case for two dad families. As a consequence of this cheery family get-together where panda learns more about his natural habitat and behaviour, regulars like Master Shifu, the furious five -- Tigress, Monkey, Mantis, Viper and Crane -- are somewhat relegated to the side-lines. More disappointingly, the Tigress-Po angle one had hoped to blossom into something more special after that fascinating boat scene in the second instalment is never brought up in the third. Even the bad guy, an ancient yak-faced spirit warrior named Kai isn't allowed enough room to spread his menace. Nonetheless, composer Hans Zimmer's terrific 'Kai theme' fans his pomposity befittingly as does J K Simmons' booming baritone. As always the star-studded voice cast of Jack Black, Dustin Hoffman, Angelina Jolie, Jackie Chan, Seth Roger, Lucy Liu, David Cross and James Hong delivers to point. But it's the ease with which latest additions, Bryan Cranston and Kate Hudson, join Po's chaotic party to express sentiment and sizzle respectively that deserves an extra hurrah. From elegant animation to Po's real name, there's much to learn and love about the newest Kung Fu Panda movie and its fabulous, floundering, furry hero. Witness him. PIX: Kung Fu Panda visits Rediff office! Holiday like Farah Khan this summer!